No more freezing ears… this hood will keep your chest, neck and head toasty and warm! Create your own boho-style fringed hood featuring a loose-ribbed hood, with a row of large Crocodile Stitch fans framing the face. The cowl section is open-weave (’V’ stitch) and is shaped so the shoulders are covered neatly. The fringe sits just below the collarbone. A tassel is the finishing touch and hangs from the point of the hood. The whole hood is worked in one piece. The back seam is completed as a side-journey. This pattern gives simple instructions and photographs for a simple-to make, quick to finish hood. Choose a long-change colourway, a variegated yarn, a single colour or work stripes and make it 2-tone. Have fun with the pattern and enjoy wearing this versatile, easy-to-wear, supremely warm hood/snood. I have made this hood using 3 different weights of yarn (14 ply, 12 ply and 10 ply), all with great results – just a slightly different generosity of fit. For the Aran yarn, I used an 8mm hook. For the chunky yarns, I recommend using an 9mm hook. The Fringed Hood Crochet Pattern has been tested by independent crocheters (some of their amateur photos are in the gallery). 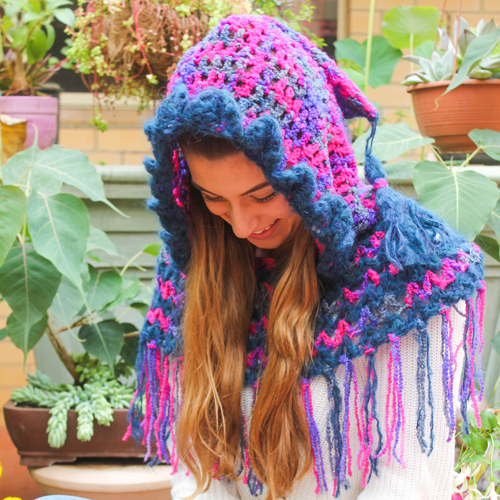 The Boho Fringed Hood Crochet Pattern is available in standard American or British terms with step-by-step instructions and photos to help guide your hook to completion.